Just received a call from the Timing Chain Settlement group (1-855-206-9873). They confirmed my name and obtained consent to record the call. It was just a courtesy call to let me know that they are still researching my "inquiry" from 3/11 and that I would receive another call on or before 3/19. Interesting. I suspect I should get a call soon as I called on the 11th as well. Just got off the phone with a rep. He told me to resubmit the claim with a personal letter stating the name and address that you got the repair work done at. He also confirmed to me that the settlement will honor work done at an independent shop. My idea is this: I'll send in that letter via mail within a week to at least have that base covered. I will also include a business card and blown-up letterhead of the shop's name and contact info, just so they can't miss it. If they want to give me a hard time, fine. I'll do battle if we cross that bridge. But until then, the rep reassured me that they will honor work done at an independent dealer. I completely understand them wanting documentation. Whenever something like this comes up, some unscrupulous people have documentation fabricated so they can get a check from the settlement. But it is a balance. You don't go so demanding as to hurt the people that you're supposed to be helping. Last edited by BRealistic; 03-14-2019 at 08:15 PM. Not sure where that 5,000 mile oil change interval came from because VW itself recommends 10,000 mile intervals for the Tiguan. But with the documentation I submitted you can see we aren't stupid and do 5,000 mile oil change intervals....because turbo and cooking oil. Also, our work was performed in July of 2017 at the independent shop so there should be no issues with date. So you are resubmitting everything? Mine only asked for the card or letterhead of the Audi dealer (mine was done at an Indy shop). I believe we had to summit the r/o for the tensioner replacement, oil changes and proof of ownership. Are you sending all that in again? I have all of this saved and scanned on the computer, anyway. It does me no harm to print it off and send it again. I'd prefer to not give these guys any excuses to deny the claim: there's no risk on my part resubmitting it. I'll be working on the personal letter to accompany the forms I mail in today, and hopefully send it off early next week. The 5000 mile is only an example... I think GTIs are 10,000mi if synthetic and 3,000 if traditional. A 10,000 mile OCI on a turbocharged, direct-injected engine is way, way too long in my opinion. Many of us are familiar with issues that occur with injectors getting stuck, HPFP seals leaking, and cooling systems not working properly. It is harsh on the engine oil, plain and simple. Back on topic, as long as you have some kind of proof that you keep the oil change intervals below 10k miles, you should be fine. There is a written statement that you can fill out to attest that you maintain the car properly, by the way. It is somewhere on the timing chain litigation site. Fully agree on the best oil/filter change interval... i've always done ~5k or 6 months. Vehicle Maintenance Declaration is what needs to be filled out for the claim. We can confirm that we have received your Supporting Documents. All claims are in process and we will contact you if we need more information. Key word in the oil change statement is "if". EG is "for example" translated. I'm with you. 5k intervals on the Golf & Passat. So, I think this was in response to the email I sent which was Friday evening, (I called on Wednesday) and it seems like I shouldn't have to submit anything else because the letter I received only mentioned one ineligibility condition. I may as a sorority sister who is an attorney if I should write to the Plaintiff's attorney or if I can feel safe that this is all they want. Last edited by migrainedinpgh; 03-15-2019 at 07:43 PM. I didn't get an email that reads like yours, but I did call today and they told me to disregard the letter (about getting it repair at an Audi dealer and send in the letterhead/card) and that no further action is needed. They will be sending me another letter and email confirming the conversation so I have it documented. this is starting to look a little better... time will tell. I sent them an email pointing to documentation that I sent the first time and now they're asking to resubmit everything again. what do you mean by "pointing"? did you attached everything to the email or just state that you sent items: x, y, and z? what are the details of your situation? just timing chain repair? entire engine replacement? VW/Audi shop or independent? I got my "Notice of Incomplete Volkswagen Timing Chain Settlement Claim Form" referencing missing "Authorized VW/Audi dealer" information and my claim is for Timing Chain + tensioner parts and labor for ~$1500 at an independent repair shop. I sent everything in a letter, they sent back a letter that I posted in the first post. I in turn sent an email explaining that the work was done at an indy shop and asking what info they were missing. They sent back an email that just says they need everything. Work was done at an indy shop, tensioner, chain was replaced, engine was not. Oh sorry... I didn't realize you were the original poster. Seems like we are all getting a variety of responses from them. WHich is why I said you need to send your info and complaints to the class attorneys who are legally required to work for you now instead of getting a circle jerk by the "claims administrator". Just received my 2nd follow-up call-back from the Claims Administrators at 10:50am eastern. This time the call came from Tampa FL (1-813-903-7100). Confirmed my name and requested consent to record the call. Seemed to just be another operator with a generic message of: Please disregard the notice of incomplete documentation regarding the Authorized Volkswagen/Audi dealer as you had the repair done at an independent facility and provided appropriate documentation. No further action is required regarding this deficiency. We apologize for any inconvenience. Then I asked about the time-line for reimbursement and she said: There is no payback time-line at this point, but we ask that you please be patient. I also emailed the class counsel (James E Cecchi) this morning with the communications thus far and a few attachments and questions. We'll see if I hear back. We are reaching out to you because our records indicate that a Notice of Incomplete Claim Form was recently sent to you and that it may have contained confusing or misleading instructions regarding supporting documentation related to an authorized Volkswagen or Audi dealership. 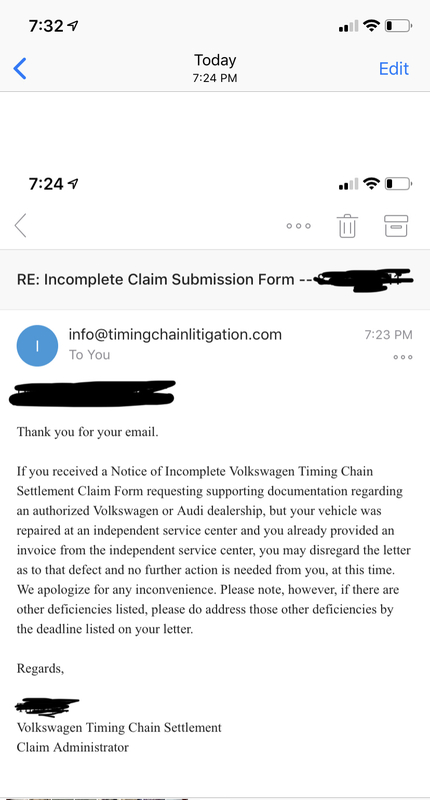 We wanted to clarify that if your vehicle was repaired at an independent service center and you have already provided documentation from the independent service center, you may disregard the deficiency language contained in the letter as it relates to requiring documentation from an authorized Volkswagen or Audi dealership. The Settlement does allow for repairs to have been conducted at an independent service provider, thus proof of repair at an authorized dealership is not a requirement. Please note, however, if there are other deficiencies listed on the letter that you received, please carefully read and respond to those deficiencies by the deadline listed on the letter. I called yesterday to follow-up from original call I placed 1 week ago; they never called me back as promised. I was told to disregard letter I received since I had the work done at an independent shop. Not sure how I feel about it now, I'm still going to send (via certified mail) all the same info I sent originally along with a letter. I also asked about a timeline for the settlement to progress and was told there were several appeals filed recently and it was still in the courts. It could be years and the terms of the settlement could change before anyone actually sees money. VW filed appeals for something they already agreed to? Who else can file appeals? Good to hear that they seem to be honoring the original claims using an indy shop. I re-sent all of my information regardless of what has been said here. It shouldn't hurt, and I'll just wait to hear back from the department.